Welcome to our death spiral. I am sorry to report that my occasional series defending the late Sen. Joseph McCarthy now turns to John Solomon, one of the precious few journalists with the grit and professionalism to be on the trail of Mueller-gate, Comey-gate, Rosenstein-gate, Uranium-gate, and the rest. Recently, Solomon wrote a column headlined “Kamala Harris and a 21st Century Example of McCarthyism.” Since I couldn’t cover my eyes forever, I read it. Solomon writes: “When I was an undergraduate student at Marquette University, I got an invaluable assignment: Write a thesis about someone who employed illogical arguments but still caused public impact. Strong word: “evil.” Solomon goes on to set forth his bona fides. Why, he’s a McCarthy expert! But who are these “political leaders?” Solomon mentions just one. Solomon’s “educator” and “witness” was himself—as a senior LBJ staffer —an anti-McCarthy partisan. How “former” were these “former socialists” in the House, anyway? Not so much, according to LBJ. “The two men were trying to get together on an incredibly complicated bill—which neither understood—on labor-management relations in the construction industry. L.B.J. finally roared into the phone: ‘You send your socialist over to negotiate with my socialist and we’ll let them settle it,” Reedy wrote, according to The New York Times. Alexandria Ocasio-Cortez is so late to this party. I don’t know, what I have read of McCarthy’s questioning sounds pretty straightforward to me. 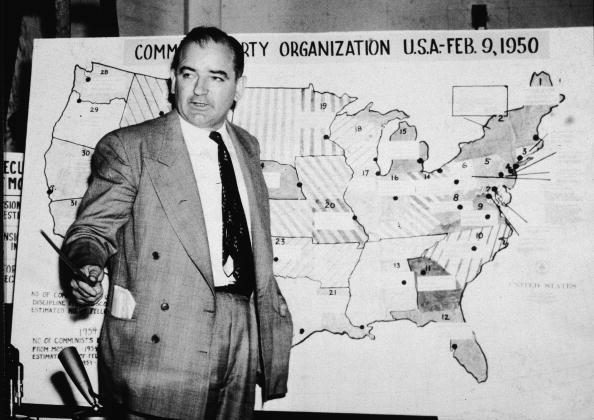 Here’s an example: McCarthy is questioning labor official Harry Hyman, identified by two ex-communists as a communist agent (who, fun fact, with five future members of the Rosenberg spy ring, attended the high school where/when David Horowitz’s father taught English as an active, covert Communist Party member). The Chairman (Sen. McCarthy): Where did you go to high school? Mr. Hyman: Seward Park High School. The Chairman: Were you a member of the Communist Party when you entered college? Mr. Hyman: Under the constitutional privilege of the Fifth Amendment, I decline to answer. The Chairman: We are going through it again. Is it correct that when you invoke the Fifth Amendment, you are invoking it because you feel your answer might tend to incriminate you? Mr. Hyman: That is correct. The Chairman: Were you engaged in espionage while you were working at the Signal Corps? The Chairman: Have you engaged in espionage in the past several weeks? The Chairman: Did you steal radar secrets from the Signal Corps Laboratory and turn them over to Julius Rosenberg? Mr. Chairman: Were you acquainted with members of the Julius Rosenberg spy ring? The Chairman: Were you part of that ring? Mr. Hyman: What was that? I’ll let the “whipped up hysteria” pass. It’s that “without a shred of evidence” that sticks out. M. Stanton Evans opens his book “Blacklisted by History” with 10 McCarthy cases, whose names resurfaced 40 years later in the sensational release of the Venona/KGB archive. These confirmed Soviet agents are Solomon Adler, Cedric Belfrage, T.A. Bisson, V. Frank Coe, Lauchlin Currie, Harold Glasser, David Karr, Mary Jane Keeney, Leonard Mins, and Franz Neumann. How can the analysis that follows stand on what is, we might say, Fake History? If Solomon reads this, I hope he decides to study the record and determine whether a correction is in order. I hope he decides that 61 years of posthumous slander of one of our most courageous patriots is enough.